Seems like everywhere I turn these days, people are talking about Pumpkin Spice Lattes. Tis the season. People are drinking their Pumpkin Spice Lattes and proudly announcing it to the world. I’ve even seen people throwing around the acronym, PSL, to describe the country’s current favorite barista-prepared beverage. Come on people! It took me about a year to learn that LOL meant Laugh out loud and not Lots of Laughs, which I somehow got stuck in my head. And I never would have figured out that FTW meant For the Win, if I hadn’t asked someone to explain. Heck, even once I knew that it meant For the Win, I still didn’t exactly understand in what context I was supposed to use it. What does For the Win even mean?? I can’t keep up. As a teen, I remember mercilessly laughing at my mom who’d recounted her story of going into the music store in search of the INXS cassette on my Christmas list and asking the clerk where she could find the Inks cassettes. Wow, I really dated myself with that last statement, didn’t I?? INXS, cassette tapes, and people actually purchasing music in non-digital form. I still have that cassette. If only I could find a functional walkman to play it in. Oh, but I am quickly becoming that hopelessly clueless mom. My children will surely be laughing at me by the time they reach second grade, when I’ll be rocking out to Green Day on the oldies station. Lots of Laughs! Somebody slap me upside the head if I ever throw on a pair of mom jeans. Anyway, back to those PSLs. The talk is contagious. I’ve found myself drooling over the thought of a Pumpkin Spice Latte. I’m a Peppermint Mocha kind of gal, but I’m pretty sure that if I were standing in front of a Starbucks barista, I’d involuntarily order a Pumpkin Spice Latte. But, I wasn’t standing in front of a barista this morning. I was at the grocery store. And as I passed the prominently displayed racks of canned pumpkin, I couldn’t help but grab a few. Canned pumpkin is a product I can stand behind. I’m a big proponent of avoiding unnecessary preservatives, thickeners, stabilizers, and flavor enhancers often found in processed foods. And if it means doing things the long way, I’m ok with that. But, canned pumpkin is a major time and mess saver which doesn’t come with any undesirable extras. The only ingredient is pumpkin; pure and simple. So, go ahead and feel good about using canned pumpkin. By all means, if you’ve got a fresh pumpkin and a bit of extra time, feel free to use that too. These little parfaits are a quick and delicious solution to a spiced pumpkin craving. They’re made simply with lightly sweetened, spiced pumpkin, layered with fresh whipped cream and crushed gingersnap cookies. 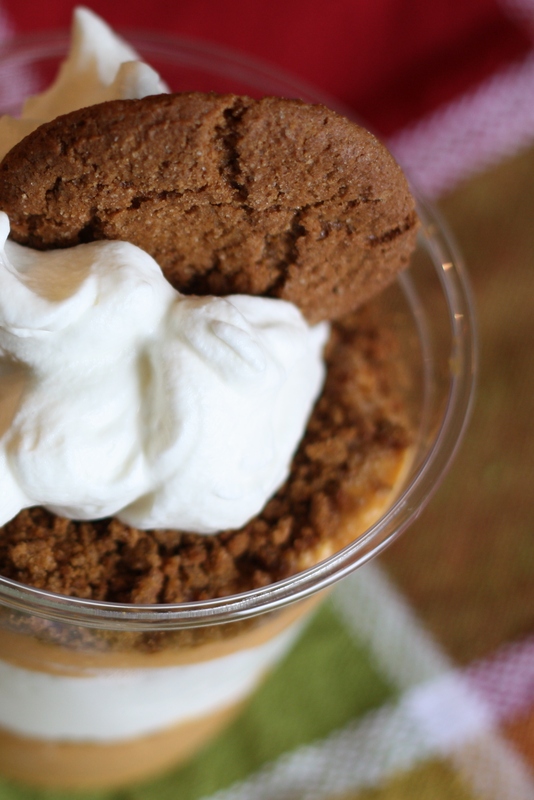 Pumpkin Gingersnap Parfaits…FTW! Crush 12 of the gingersnap cookies. Set aside. Beat together the pumpkin, cream cheese, brown sugar, and spices until evenly combined. In a separate bowl, beat together the heavy cream and sugar until thickened. To assemble the parfaits, divide half of the pumpkin mixture into four cups. Sprinkle 1/3 of the gingersnap crumbs over the pumpkin. Spoon about half of the whipped cream over the gingersnaps in the four cups. Sprinkle with another 1/3 of the gingersnap crumbs. Spoon the remaining pumpkin mixture over the gingersnap crumbs. Sprinkle with the remaining crumbs. Garnish with the remaining whipped cream and a gingersnap cookie. Posted in Desserts, Food, Recipes and tagged cookies, Cooking, dessert, Food, food photography, life, pumpkin, Recipes. Bookmark the permalink. Hi Geni! Nice to meet you! Thanks for the comments! I have never heard the acronym PSL, but I love it! I do love me a good PSL. Your parfaits look delicious. Oh wow! I could do with a cup of that parfait they look so delicious! ummmm, yummy!!! What perfect parfaits! I haven’t ever had one with pumpkin before, but I think I will have to try it now! This looks delicious. I’m going to have to try to make these! Oh my god, that looks absolutely amazing. I really, really want one NOW. Will definitely have to try, thanks! lovely cookies! and that parfait! amazing! My friend brought these over last night…she found your recipe on Foodbuzz…we LOVED this. SO good!!! Glad you liked them! Thanks so much for your comment! These look wonderful. Found the recipe via Aggies Kitchen. BTW, I heard yesterday that Sony is about to stop producing Walkmans. 😦 Makes me feel old too. Also, I love the font that you use for your blog post titles; what’s the name of it? absolutely want to try this recipe!!! however, i am not a fan of cream cheese….. would there be an adequate substitute? the rest of it sounds DELISH! I think you can definitely get by without the cream cheese. Try substituting some marscarpone cheese or even some lightly sweetened whipped cream, just to lighten up the pumpkin and give it a touch of creaminess. Or skip the cream cheese completely and adjust the sweetness of the pumpkin puree to your liking. Mmmmmm! I found your blog through Sugar Rush. I think I’m going to put this on my “must try” list for this Thanksgiving! Thanks! Nummy. We’ll have to try these. Well, maybe not “most common”, but definitely common. I am making these tomorrow in some gorgeous lead crystal low ball tumblers and taking them to the dinner party I was invited to go to. I will be sure to take a few photos and let you all know what everyone thought! I am VERY excited! Let us know how you enjoyed them!! They are beautiful and very, very RICH. If I had to do it all over again I would make them in champagne flutes and make sure to fill the flute no more than two thirds full. Of course, that would require ANOTHER shopping trip for spoons with very long stems in order to dig the creamy goodness out of the bottom of the glass. I would also make sure to have CRUNCHY ginger snaps. Mine were too gooey. The vanilla pudding sounds like a great addition!! Yep! They should hold up fine in the fridge for a few hours! Enjoy! I made them yesterday and served them today, so if anyone is wondering if they hold up overnight they definitely do! The directions and the pics don’ t match up. It looks like the crumbs top the pumpkin and not the cream. They look delicious and I plan to make them soon. I wonder if this would be any good with greek yogourt instead of whipped cream (whipped cream doesnt agree with me), thoughts? I bet it would be delicious with some vanilla greek yogurt! 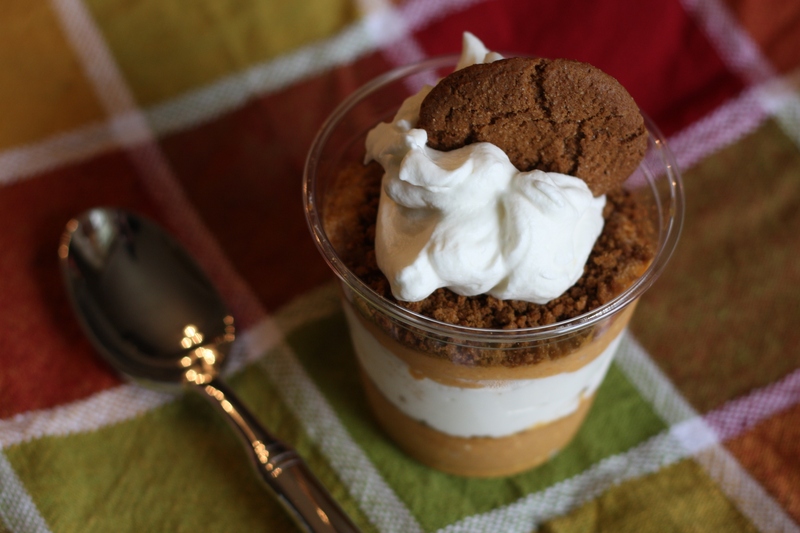 Hi Amy – I used your Pumpkin Gingersnap Parfaits on my Chinet Ultimate Block Party contest board early this year. My board won and part of the prize was a bock party (a 15K win!). All the guests *loved* the parfaits and I’ll be making them again for Thanksgiving. They’re super delicious! Here’s a link to the block party pictures on the Chinet FB site–I think you may spot the parfaits in a pic or two: http://www.facebook.com/Chinet#!/media/set/?set=a.10151242608528151.485238.142022693150&type=3. Thanks so very much for the great recipe! That’s great, Lesa! Congrats on your win!! And thanks for letting me know about it! Your block party looks like it was awesome!